Oh MOTHER! That was bad. A couple’s relationship is tested when uninvited guests arrive at their home, disrupting their tranquil existence. I guess I wasn’t as big an Aronofsky fan as I thought. The very epitome of a Marmite movie. For some, an existential dissection of life through religious allegory. For me, a meandering mess split into two agonizing halves that failed to deliver. To be honest, it didn’t help that the marketing and posters suggested something more horrific. Now don’t get me wrong, Mother! is a modern horror . . . Of sorts. BUT I was expecting a demented take on Rosemary’s Baby (Like it wasn’t demented already). And there was an echo of that in the closing act BUT this just didn’t go in the direction I hoped at all. Seriously, pay attention to the first five minutes. The path is established pretty early on. And if I didn’t have this ridiculous rule of seeing a movie out to the end; I would have joined the several people that walked out 30 minutes in. This isn’t the worst film I’ve seen (BUT could be for this year). Credit where it is due. The cast all played their parts well. The first half of the film was slow burning BUT intriguing as Him’s (Bardem) writer’s block took its toll on the couple’s relationship. Jennifer Lawrence carried this film as much as she could as Mother. Doing her best to be a supportive wife. Giving Him space and revamping an old country house in a wonderfully tranquil (yet strangely eery) pastoral setting. I felt for Mother’s frustration and confusion; especially when the mysterious Man (Ed Harris) made his introduction. A diversion for Him. A disturbance for Mother. The question’s mounting as Him welcomed Man into their home with no hesitation. Drinking and chatting rubbish. The paranoia setting in. Why is he really here? Why now? Things took an even stranger turn when Man’s wife Woman (Michelle Pfeiffer) turned up. Inventive names, aren’t they? Lazy or clever? I’ll leave that to you (LAZY!). I had to suspend my disbelief and remember this was a movie. There is no way that I would let my partner invite a strange couple we’ve only just met into my home. No-se-re. I loved Psycho-Pfeiffer. It was great to see her back. Showing Lawrence how it’s done. She played the crazy doctor wife brilliantly. Mind games well and truly in flow. Like a cat playing with a mouse (And yes, I totally meant the Catwoman reference). The pace was agonizing BUT I was still wanting to see where this was going. BUT the second half of the film completely ruined all that build up. So much so that by the end, it made that story line (almost) completely irrelevant. Aronofsky really did pull the wool over my eyes. He completely turned the film on its head. I expected this domestic psycho-thriller to unfold into something else. BUT not this! With more and more people turning up to see Him, I thought something creepier was going to happen. Especially with the haunting sequences in which the house appeared to be “speaking” to Mother. A bleeding heart in a toilet was an unexpected image I won’t forget any time soon. I mean it was unsettling BUT it was such a bloody visceral mess and not in the good kind. I could see what the director was trying to do. Delivering social commentary and satire. BUT there was only so much religious imagery and mayhem that I could take! The finale unravelled his true intent and I was surprised. I just didn’t like the end result. It wasn’t worth the two hour slogfest. I didn’t enjoy it (Not that it was ever going to be a movie for “enjoyment”). Okay granted, it has a been over a month since I saw Mother! and the experience is still fresh in my memory. BUT I think that was only because of the sheer disappointment. It was torturous. I felt like I was going through this chaotic hell ride with Mother. A ride that I wish I hadn’t taken. Even with the surprising cameos popping up in the mental and sporadic closing minutes. 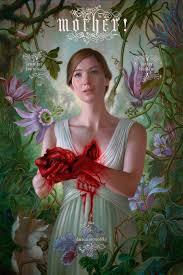 As much as I have had time to discuss plot points and themes, I still didn’t think Mother! was that special. Bravo, Mr Aronofsky for pulling the wool over my eyes. You won’t be doing it again. The people who made this will be sleeping with the fishes . . . The Manzoni family, a notorious mafia clan, is relocated to Normandy, France under the witness protection program, where fitting in soon becomes challenging as their old habits die hard. With such a strong cast and production team (Martin “Goodfellas” Scorsese and Luc “Leon” Besson), how could The Family be such a ridiculously unfunny and drawn out affair? De Niro applied his usual gangster schtick BUT to no avail. Especially when we’ve seen him poke fun at himself before and a whole lot better. Just watch Analyze This. Hell, even check out the mediocre sequel. Luckily De Niro and Pfeiffer were a great pairing. BUT Dianna Agron (Stunning though she is. What?) plays such a flat character. Her silly little love subplot with her French teacher was so cliched. A shame considering the potential she showed during an altercation involving a tennis racket. While John D’Leo’s cocky schoolboy just annoyed the hell out of me. NOT even Tommy Lee Jones with his hang dog expression could save the day. In fact, he looked just as fed up as I did watching the film. The plot and tone were all over the place. It took a good hour before anything really made you smile or interested. It stuttered along. Bordering on either ridiculous or just plain dull. Desperate to be dark and funny and failing on both counts. A mess. For example, Pfeiffer’s Maggie is insulted by the French shopper so she blows up the supermarket?! De Niro’s “Fred” doesn’t like having brown water ooze out of his taps so he beats up a plumber and drags a water company executive across the tarmac. If you found that funny, then give this a go. Believe me, I’m making it sound better. BUT it wasn’t enough. I sat patiently drudging through all this “build up”. Waiting for a ridiculous high octane shoot em up finale. Everything was there, ripe for the taking and for five minutes (That’s right. Five minutes! ), my attention was finally piqued. I was finally into it and then it just ended. The film must have been desperate for jokes because it had to rely on in-jokes. There was one scene in which De Niro and Jones meet at a film screening. The film was Goodfellas. Cue a cheeky wink from the man himself. Some say lazy, I say needed. It got a smile out of me. Besson should have taken lessons from the fantastic TV show Lillyhammer with Steven van Zandt. The premise had so much potential and failed so badly. That cast must have needed the money. Good moments does not a good movie make!